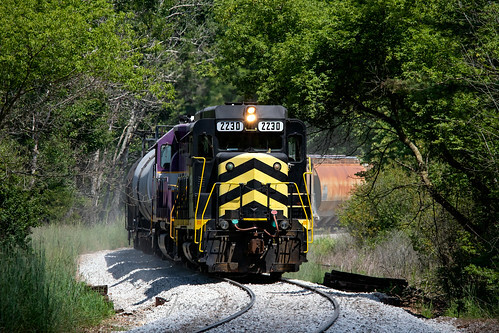 Last August, I was able to seriously railfan the Indiana Northeastern for the first time. I, Mr. Hall and Mr. Guest made the trip down on what would become a beautiful day. Below is what we found on that day. 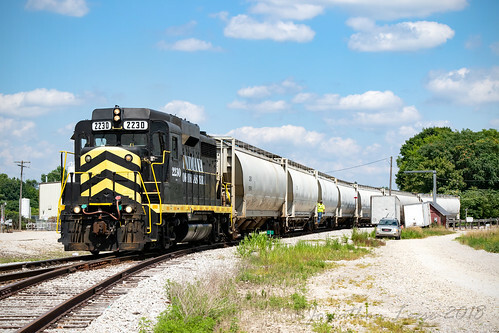 A few months ago, CSX re-instated a pair of Grand Rapids to Detroit road trains, Q328 and Q329. While Q329 usually arrives in Grand Rapids in the middle of the day, Q328 is usually long gone by sunrise. 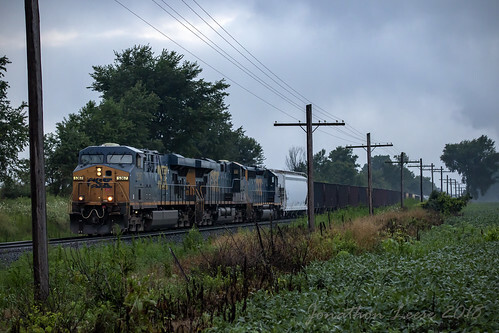 Leaving early to head south to the Indiana Northeastern, combined with the train leaving GR a bit later than normal, afforded this view of 328 heading east near Woodbury, behind 2 GEs (one of which was dead in tow, the reason for the delay) and an SD40-2 not long after sunrise. Indiana Northeastern #3084 has just arrived in Ashley from the west and will perform some switching moves in town before heading east. 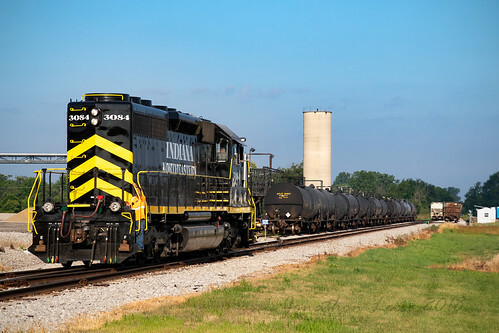 Indiana Northeastern SD40-2 #3125 sparkles in the morning sun at the INER's shop in Hudson, IN. The shop crews were in the process of putting the final finishing touches on the 3125 before releasing it for service after repainting. 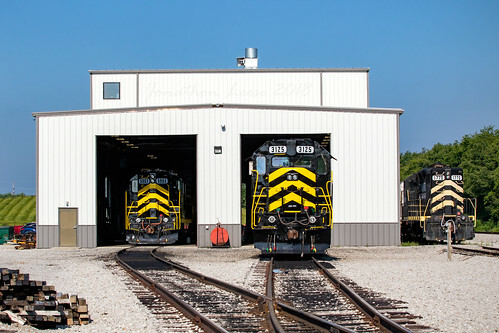 GP9H #5903 and GP7u #2216 can be seen behind #3125, peering out from the shop. 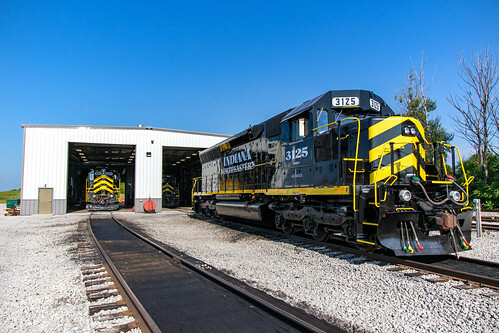 Indiana Northeastern's new shops in Hudson, IN are truly a testament to the pride in which the employees take in their railroad. 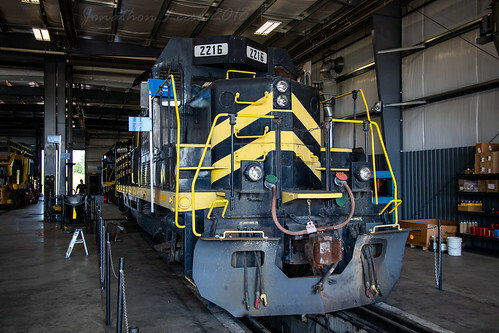 The floors are clean, the tools are organized and the locomotives are spotless! A sunny August morning finds GP9H 5903, SD40-2 3125 and GP10 1770 waiting for the call to duty. IN 1602 gets some attention in the Indiana Northeastern's shops in Hudson. 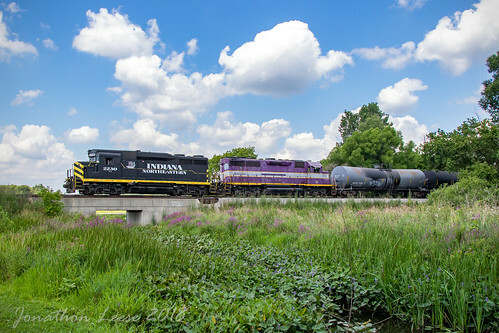 Built in 1957 for the Great Northern, the veteran GP9 has been on the INER's roster since the railroad began operations in 1992, coming from the defunct Hillsdale County Railroad. IN 2216 is a former Santa Fe GP7, rebuilt to a GP7u by the ATSF at their Topeka, KS shops in the 1970s. Out of service on this day, the engine was having its trucks worked on. 2216 was built as ATSF 2746 in 1952. GP9H (the "H" standing for Hudson, I assume) 5903 rests in the INER shops in Hudson, IN. The old Geep was rebuilt a couple of years ago and was given its original Cleveland Union Terminal number back. 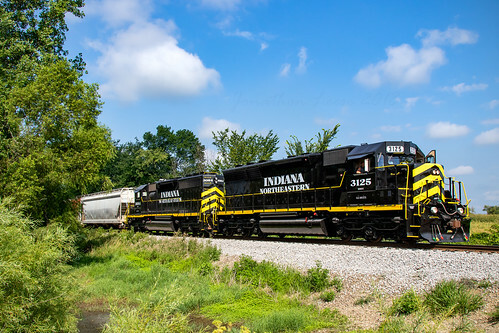 Indiana Northeastern's pair of SD40-2s (rebuilt from an SD45 and an SD40) head east from Ashley on their first trip together after both being completely repainted. 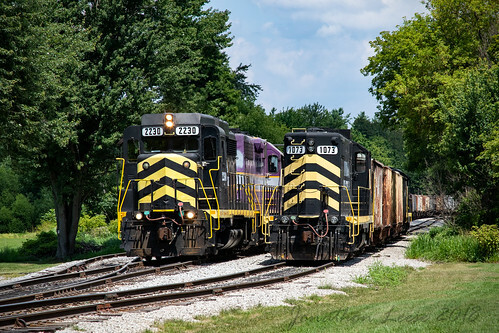 Both of Indiana Northeastern's new SD40-2s, #3125 and #3084, lead their train east through the trees near Hamilton, IN. Originally the crew was going to work around Ashley and call it a day, however plans changed and it was decided to head back to the shops with 3084 to grab 3125, and the whole train would be taken to the NS interchange in Montpelier, OH. 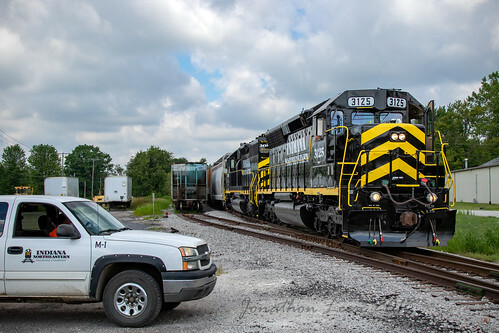 The conductor of an eastbound Indiana Northeastern train gets ready to inspect his train from the company truck at Hamilton. Slow orders have the 3125 creeping into town on this day. 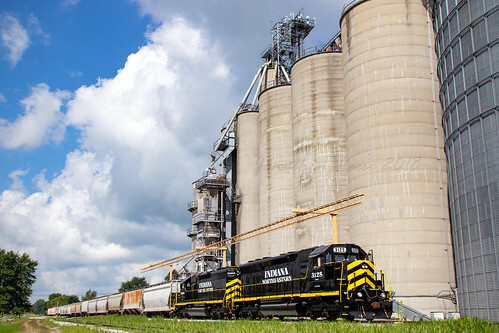 Indiana Northeastern's spiffy pair of rebuilt SD40-2s lead their train east past the large grain silos at Edon. The crew is headed for the NS interchange in Montpelier, and have some more work to do enroute before making the swap with NS. IN 3125 was originally built as a Southern Pacific SD45 while 3084 began life as a Canadian Pacific SD40. 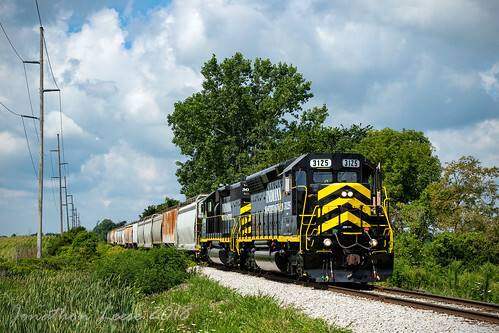 Indiana Northeastern 3125 and 3084 roll through the countryside in Northwest Ohio. The crew will be stopping at a customer just behind me to do some switching before continuing on to the NS interchange in Montpelier. 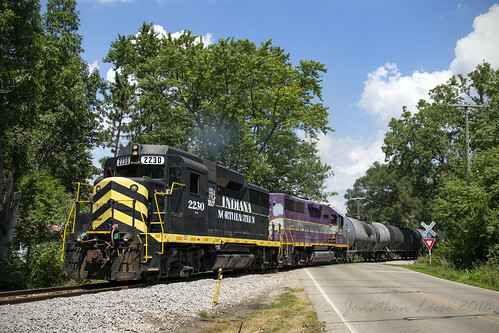 With a long, heavy train in tow, Indiana Northeastern's Hillsdale job leaves Hillsdale behind GP30 #2230 and US DOT GP40-3 #2000. Both of these turbocharged EMDs were working hard! 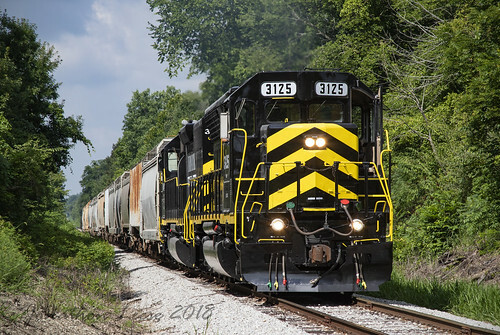 Indiana Northeastern's Hillsdale job is rolling along at a good clip, seen here negotiating the S-curve near Bankers Lake. Recent track work is evident by the fresh ballast and old ties littering the right of way through here. Indiana Northeastern's Hillsdale job rolls past a parked ballast train in the siding at Reading. The crew will stop here momentarily to pick up a hopper from the elevator before continuing south. After picking up a single hopper at the elevator, Indiana Northeastern #2230 and DOTX #2000 blast off with turbo-chargers screaming westbound across M-49. Indiana Northeastern's Hillsdale job rolls over a small bridge behind GP30 #2230 and GP40-3 #2000, just west of Reading. 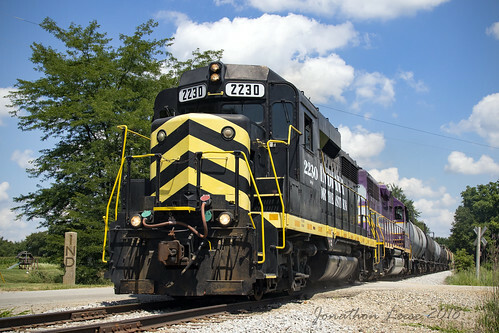 "Purple People Eater" 2000 has since been repainted into the INER's black and yellow scheme. 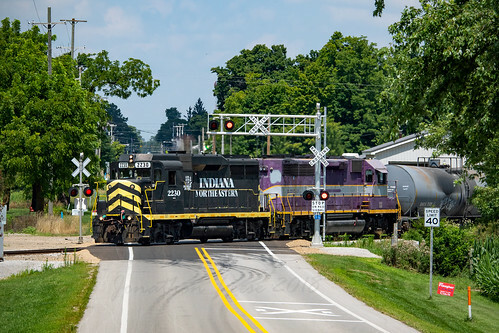 2230 is in Indiana while 2000 is still in Michigan as Indiana Northeastern's Hillsdale job crosses the state line. The marker to left of the engine was placed here by the Lake Shore & Michigan Southern, over 100 years ago! Upon arriving in Fremont, the crew left DOTX #2000 and the rest of the train tied down north of town and took 2230 south light to do a bit of switching. Here they are switching the transload facility just north of I-80/90. Heritage engines are still a thing, right? Here's one I haven't seen anyway, the Norfolk & Western painted 8103, leading intermodal train 23K west at Butler, IN. 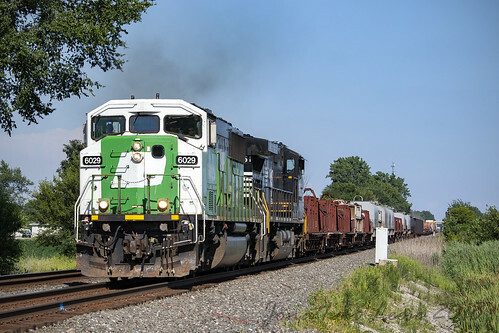 One of probably the coolest leased locomotives currently out there, CBFX #6029, is an ex Burlington Northern SD60M still in its Cascade Green paint job. 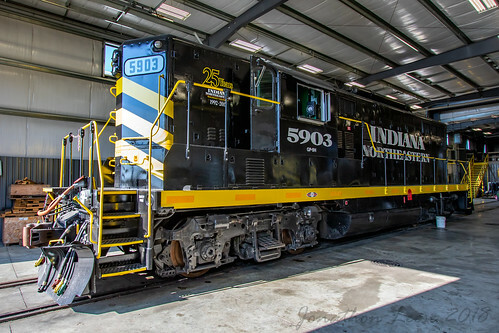 NS currently has a few of these on lease, and also owns 5 ex BN SD60Ms as well. Pulling hard, 6029 and an NS Dash 9 accelerate west with 39E after being passed by 23K (which had the N&W heritage unit leading). Just outside of Butler, IN. Thanks SD80. I liked the pictures and report especially the background on the engines. Great Trip report SD80. Love the descriptions. Also, I think that is 2nd 1602. IIRC the first was a GP7 of RDG heritage that was acquired in 1976 by the original HCRC. I show the two ex-GN GP9's acquired in 1986 by HCRC. AARR wrote: Also, I think that is 2nd 1602. IIRC the first was a GP7 of RDG heritage that was acquired in 1976 by the original HCRC. I show the two ex-GN GP9's acquired in 1986 by HCRC. 1601 is the former Reading GP7. 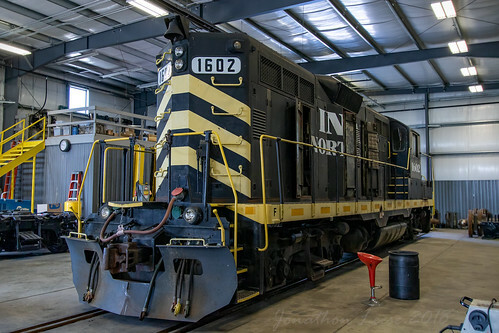 The 1602 is the only active former GN GP9, 1770 has been dead for awhile. The 5903 (ex-1603) is former CUT.